Stacey Steers, “Edge of Alchemy Photograph #3,” 2017, gelatin silver print with hand coloring and acrylic paint, 11 x 14"
Filmmaking has become so seamlessly illusionistic, due to digital technology, that we take for granted how powerful its magic is — and how empty its spectacles of improbable heroics and impossible physics can become, absent a compelling story and a unified creative vision. In the realm of film as art, the lure of technology is as strong as it is in mainstream commercial cinema. To watch the films of William Kentridge, some of which feature primitive stop-motion animation of charcoal drawings, or Christian Marclay’s "The Clock," which joins together snippets of commercial films arranged chronologically, is to see that technology need not be the master of creativity. Stacey Steers, an established filmmaker, enters the art world with "Edge of Alchemy," a nineteen-minute film. She joins, I think, the ranks of Kentridge and Marclay. With an evocative score by Lech Jankowski, Steers’ compelling film collage combines footage from classic silent movies of Mary Pickford (including Victor Sjostrom’s 1928 "The Wind") and Janet Gaynor (including F.W. Murnau’s 1927 “Sunrise") with collage elements from nineteenth-century engravings and woodcuts. Steers effectively creates an atemporal, enigmatic narrative involving a Scientist (Pickford) and a Creature (Gaynor), bedecked in wing-like leaves and a honeycomb hat. (Clips from James Whale’s 1933 "The Bride of Frankenstein" are easily recognized.) 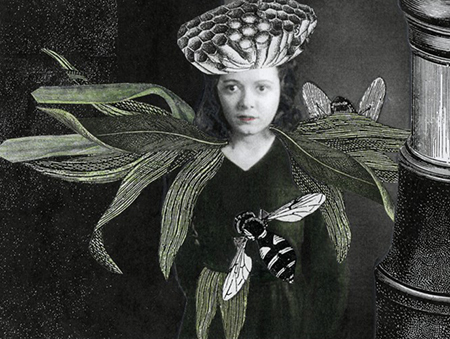 If the story is nonlinear and open to interpretation, the film’s world of magical metamorphosis — with spheroids, giant honeybees, enlarged tableware, scientific apparatuses, and blossom cascades weaving in and out — has roots in the cut-and-paste fantasy kingdoms of Max Ernst, Joseph Cornell, Wilfried Satty and Lawrence Jordan. Their curiouser-and-curiouser interpretations of the Victorian era are relevant to our contemporary world of wonders, alternatively inspiring and disquieting. Also shown is an archaic-looking optical device, an “Oculus,” that displays the film in miniature (as Tracy Snelling does with her tiny towns); hand-colored collages made from film stills; and, in binders kept at the desk, some of the thousands of collages employed in creating the film, old-school-style.